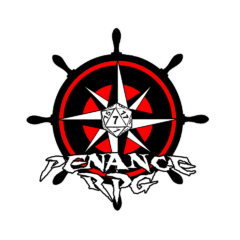 Welcome to the new website for Penance RPG. It’s still a little work in progress but we’re getting there. Firstly we have our fantastic new logo. It was something I came up with from the depths of my own scrambled brains that the awesome Jon Moore managed to create and I think it looks amazing. We hope you all like it as much as I do. Episode 30, as the finale of Season 2, will be the last episode to appear on Soundcloud. All of our previous episodes have now been successfully moved over from SC and Ellie has even managed to find the time to go back and remaster our first series, fixing several of the more glaring issues and hopefully reducing the “please just skip to season 2” feeling that I’m sure other podcasts share looking back on their own infancy. There are still a few issues with the sound quality of season 1 but this has made it significantly better and thank you all for sticking with us through it.